Do you want to see our product in action? Click here to see a flash demo of the OpenPro product highlights. Or, if you prefer, you can visit our website and see the flash demo there. If you have any questions, please email infoop@openpro.com and one of our customer service personnel will respond promptly. Why should you choose OpenPro ERP and CRM packages during a recession? During a recession, you need to work smarter, not just harder. With the right ERP & CRM, your business can become more strategic and more profitable by applying its resources more efficiently to serving and developing customers and suppliers. OpenPro has time saving utilities to handle more customers while requiring fewer resources. 1. Get more out of your established customers. Even when money is tight there are opportunities to sell more to some of your existing customers. The trick is to use effective techniques and offer the right merchandise at the right time. One of OpenPro ERP & CRM’s greatest strengths is that they collect and organize information about your customers, helping you analyze the data for future opportunities. For example, you can use OpenPro ERP & CRM data to do a needs-based segment analysis of your various classes of customers. Needs-based analysis involves taking the customer’s perspective and identifying what they need but are not buying. Using this information, you can develop a sales strategy that will let you offer products in an appealing way even in economically difficult times. Often this involves packaging new goods and services with products your customers are already buying and offering them at an attractive price or with other incentives. In the same way, OpenPro ERP & CRM can help you identify the most productive items to sell to your customers. These are not necessarily the highest-margin items, not if those high-margin items have long sell cycles and require a lot of sales effort. One additional useful metric that is easily derived from OpenPro ERP & CRM data is the profit produced per hour of sales effort for each class of items. Armed with this information, you can craft sales programs that emphasize the products which have the most effect on your bottom line. 2. Identify and concentrate on your best customers and suppliers. While every customer and supplier is important when business is slow, some are worth more than others. By allocating your sales efforts accordingly, you can produce more revenue per sales hour and higher average sales. OpenPro ERP & CRM systems contain tools for analyzing your customer base so you can categorize your customers. Sometimes the analysis will turn up surprising, even counterintuitive, results. The customer who gives you an order on every sales call may not be worth as much as the customer who orders infrequently but buys larger quantities of high-value merchandise. You can also use OpenPro ERP & CRM analytical tools to slice and dice your customer and suppliers base beyond simply ranking by revenue. For example, you can look at the return per sales hour for each customer. Or you can see which lines are most profitable and which customers are more likely to purchase them. In fact, with the thorough OpenPro ERP & CRM system and a properly populated sales and customer database, you can find all sorts of not-so-obvious but important relationships. 3. Target your customer and suppliers development efforts. Just because the economy is in a slump doesn’t mean that you should stop trying to attract new customers. However, like everything else in a recession, you want to do it more efficiently. This implies paying closer attention to lead analysis. Which leads are most likely to become customers? What are they likely to purchase? Since in a recession you want to go hunting where the ducks are, you can use OpenPro ERP & CRM information to determine where a lead is in the buy cycle. You may want to concentrate your efforts on the potential customers who are closest to making the buying decision to reap more immediate rewards of your sales efforts. 4. Keep your existing customers loyal. In a recession, existing customers are gold. You want to keep them happy. Customer satisfaction covers a lot of ground, but it involves two ideas: keep your promises to customers and meet their demonstrated needs. OpenPro ERP & CRM can help you with both of these. The most common reason for not keeping promises is forgetting they were made. If you stress to your sales force the importance of entering all agreements made with customers into your OpenPro ERP & CRM system, it will be easier for your organization to execute on its promises. Even minor mistakes can make a difference in an economic downturn. If you promise to contact a customer on Tuesday and don’t get back to him or her until Thursday, you not only haven’t met the customer’s expectations, but you have subtly implied how much you value that customer. Enough incidents like that, trivial though they may seem, and the customer is likely to be receptive to a competitor even if he or she can’t beat you on price. Likewise, OpenPro ERP & CRM can be used to ensure you’re meeting customers’ needs as fully as possible. This includes efficient handling of after-sales contacts, such as service calls, resolving customer concerns or offering the customer the right mix of products at the right prices. 5. Work smarter, not just harder. OpenPro ERP & CRM lets your sales and customer support reps work smarter. With better information at their finger tips and best practices codified into your business policies, you can optimize service for your customers and maximize revenue. 6. Use of cost effective ERP & CRM solutions instead of just any solution. Finally, ERP solutions can cost you money, but not having any ERP solutions will cost you more. Many companies are running with an accounting solutions and spreadsheets or databases. Since everything is not tightly integrated, you spend more time with incorrect data and double or triple entry. An ERP and CRM solution like OpenPro cost up to 90% less than its competitors. For further information, you can peruse the OpenPro website and feel free to email infoop@openpro.com with any questions you may have. OpenPro has been around since 1998. We are the first fully on-demand web-based ERP software solution on the market. At OpenPro we believe our success is dependent on the success of our customers. Being customer centric is our way of life. We live for our customers and we work side-by-side with them to ensure their OpenPro Implementation exceeds their expectations. OpenPro has features that are 5+ years ahead of our competition. Our fully integrated system includes Enterprise Resource Planning (ERP), Customer Relationship Management (CRM), Financials, Manufacturing, E-Commerce and more. OpenPro delivers more value and more features. 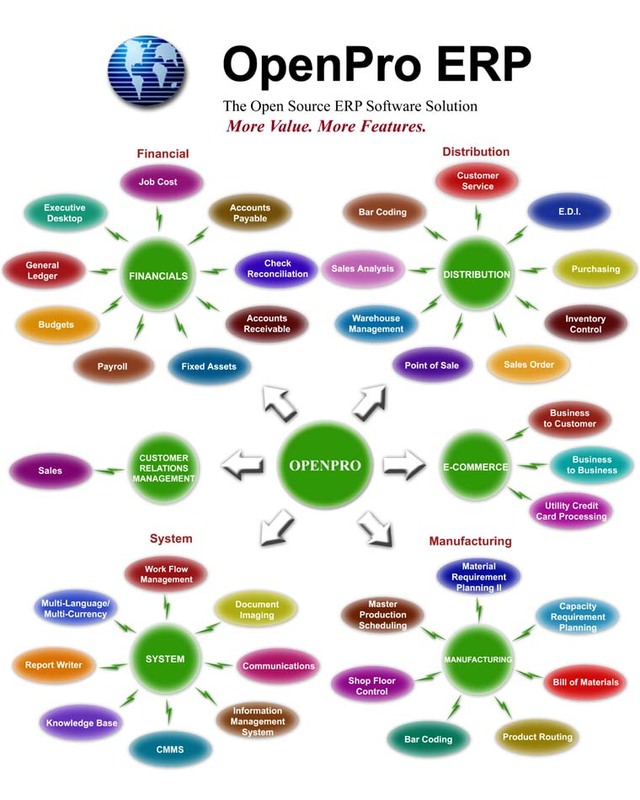 OpenPro is a leader in licensed Enterprise Resource Planning (ERP) software using open source technology. We have the most experience of any web-based application in the world. With OpenPro, you have the opportunity to select from a wide range of user-friendly software modules. You can tailor solutions based on your specific requirements, providing confidence that your system will always be on the cutting edge of technology. You choose your server operating systems, database, and the modules you require. We make source code available to customers. Customers may purchase the software, bring it in-house or have it hosted ASP, Cloud Base, On-Demand or as a Software As A Service (SAAS) solution. We have turn key solutions with IBM using Pure Application. OpenPro is an open source product written in PHP. Unlike our competitors, our size allows us to be extremely agile, so we can incorporate new functions, technologies and changes sooner than industry standards. In fact, we will often incorporate new customer requirements prior to the system’s purchase. In addition to knowledgeable phone support, we offer emergency services to expedite technical diagnostics. In most cases, you can count on resolving your situation with one contact. Ongoing support service is strongly recommended to make sure you get the most out of your OpenPro system. OpenPro is a unique product that runs on all industry standard servers, clients and operating systems. OpenPro has the fastest return on investment rate in the industry. OpenPro is written using open source technology to give you a quick Return On Investment. OpenPro’s web-based design makes it easy to use and faster for training and implementation. With OpenPro, everyone is a power user. Built to unleash the power of your entire organization, OpenPro’s user-friendly environment is as easy and intuitive to navigate as today’s consumer websites. We have integrated the latest desktop functionality, such as email, access to mobile devices, bar coding, office interaction, phones, faxes and printers. OpenPro and its partners are trained for a fast and structured implementation approach. Fast and efficient implementations save you money, a quicker ROI. OpenPro has an exclusive “ERP in a day” program, to get your system up and running in one day. OpenPro is a pioneer in the ERP industry. First fully web or browser based ERP software package on the market. Requires no client. First to integrate work flow in its ERP software package. First to give purchase options, software as a service, or purchase, or lease in house or hosted. First to use Open Source LAMP Technology with a complete ERP package. First to include document imaging. If you have any questions or would like to request more information about OpenPro ERP software, please visit our website.